HIALEAH, FL–As you enter through the gate and drive toward the clubhouse entrance there’s an instant where you can imagine Hialeah as it once was. The palm trees and shrubs still line the grand entranceway, just as they did when Winston Churchill, Jackie Kennedy, the Vanderbilts, Palm Beach society and every notable trainer and owner in the East made their way toward a racetrack that typified beauty, class, history and great racing. But turn a corner and you are jolted, face to face with the reality of what Hialeah has become: a nightmarish freak show. The parking lot is empty, the entrance into the clubhouse appears abandoned, untouched and unattended to for who knows how long. Keep going, out to the apron and there you will see racing that has been called ‘a sham,’ and ‘fake racing.’ Hialeah’s owner, John Brunetti, himself, once called the sort of racing that has been going on for a while at backwoods “racetracks” in Northern Florida the “Mickey Mouse circuit.” Here’s a better way to describe it: grotesque. What else would you describe something where the competitors include a 22-year-old horse, a poor thing named Miss Minnie Matt? The ancient mare was there to take part in what Hialeah management passes off as Quarter Horse racing. It is not. To say it is Quarter Horse Racing, or any kind of real racing, is a mockery. It is, instead, a farce that allows Hialeah to maintain its license to have slots, poker and simulcasting. Watch one of Hialeah’s 16 Sunday races here. The concept was created by devious, but creative, individuals. In order to have various forms of gaming, Florida racetracks must have, according to law, “horse racing.” Which means what? An argument was made that as long as any kind and any number of horses were pitted in a competition against one another that was “horse racing” and that was good enough to have a gaming license. A 22-year-old horse racing 110 yards against some other animal? Why not, or so said the Florida courts and the Florida Division of Pari-Mutuel racing. It began at a place called Gretna Racing and spread to places named Oxford Downs and Hamilton Downs. At first, Gretna conducted pari-mutuel barrel racing, but someone actually put their foot down and said that was not “horse racing.” Little did it matter, as the rogue tracks just took the same horses and riders and conducted short match races. During the fiscal year that ended in June, 2016, the handle at Gretna was $73. That’s not for a race or even a card, but for the entire meet. Hialeah was late to join the party. 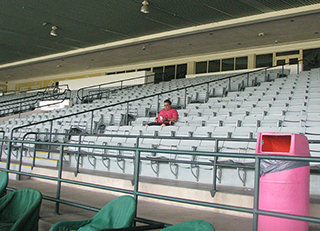 Squeezed out by competition from Calder and Gulfstream, Hialeah ran its final thoroughbred race in 2001. With slot machines having come onto the table, Hialeah re-opened in 2009 with Quarter Horse racing, which allowed it to have gaming. And while purists may not have appreciated a track with such a rich Thoroughbred history running Quarter Horse races, at least they were “real” Quarter Horse races. Hialeah paid out $140,000 a day in purses, had a 40-day meet, and entered into a contract with a legitimate Quarter Horse horsemen’s association. That was the situation until Hialeah management saw the light or, perhaps, the darkness. If Gretna, Oxford and Hamilton could do it, why couldn’t they? A tremendous amount of purse money could be saved if Hialeah ran fake Quarter Horse races rather than real ones. So they pushed aside the Florida Quarter Horse Racing Association and signed an agreement with a previously unknown horsemen’s group that has ties to Gretna. It’s a Sunday and the Hialeah program kicks off at noon with the first of 16 races. In order to satisfy the requirement of having to run a 40-day meet, the Hialeah card is divided into two programs of eight races each. They’re taking advantage of a loophole so they can really operate only 20 days instead of 40. Another rule that requires a minimum of five entrants in a race is also conveniently overlooked. The program lists two horses in each race, plus three also-eligibles. The same three horses are the also-eligibles in all 16 races. Intimidating Jess beats This Star Is Shining in the opener and the races keep going and going, each one looking exactly like the one before it. Two horses break from something resembling a starting gate and run for seven seconds or so. The jockeys, all of them female, all wear jeans, have Western saddles, and their legs are fully extended as they ride. The silks are red for the one, white for the two. There are no purses or past performances in the program but I’m told that the winner of each race gets $2,000 and the loser $750. It seems like an astonishing amount of money for horses that might otherwise be sitting in someone’s backyard. Horse racing has its roots in match races, one horse owner challenging another, convinced his horse was faster than his rival and willing to bet his money that he is right. But there’s nothing quaint, historic or charming about these races. Nothing at all. Starter Smokeking Enterprise is 17. Matts Red Cloud is 18, the same age as Impressive Hipockets. Thirteen races down, three to go, the 22 year-old Miss Minnie Matt comes on to the racetrack to take on the 5-year-old Smokeking Rosa. Along with her age, all the program tells us is that she is owned and trained by Jim Handley and the rider is Marni Wintermute. The horse is registered with the American Quarter Horse Racing Association but has never run in a sanctioned race. Everything else about her life is a mystery. The 22-year-old has a tired countenance on her face as she prepares for the race. With apparent compassion for her elderly partner, Wintermute does not push her to run as she is badly beaten on her way to making an easy $750 for Handley. It’s the right and the wrong thing to do. A joke or not, there is betting on the race. It is one thing to have this sham go on in a cow pasture somewhere out in the middle of nowhere at a place that never was and never will be a racetrack. This is Hialeah. Poor old, tired Miss Minnie Matt traversed the same hallowed dirt that Citation, Seattle Slew, Northern Dancer, War Admiral and so many other greats thundered over on their way to victory. Slot machines and horse racing have always had an uncomfortable marriage. But it was never supposed to come to this. Slots, and other forms of gambling, came to racetracks and the deal was not meant to merely make track owners even more wealthy. The machines were also supposed to benefit the sport of horse racing and no one was supposed to be able to have alternative gambling at the tracks without racing. Real racing, that is. Frank Stronach would never do this at Gulfstream. But he could. In the Hialeah management offices, they must be having a good laugh as the slots whirl, the money rolls in and Miss Minnie Matt keeps showing up in the entries. Not only did Miss Minnie Matt lose on this day. So did decency.